Last time I wrote about my mystery garden. I had things growing I did not expect. Some things I planted did not come up. I especially did not know what the large round vegetable would be. Now the harvest time has come for some of the plants and I have my answers. 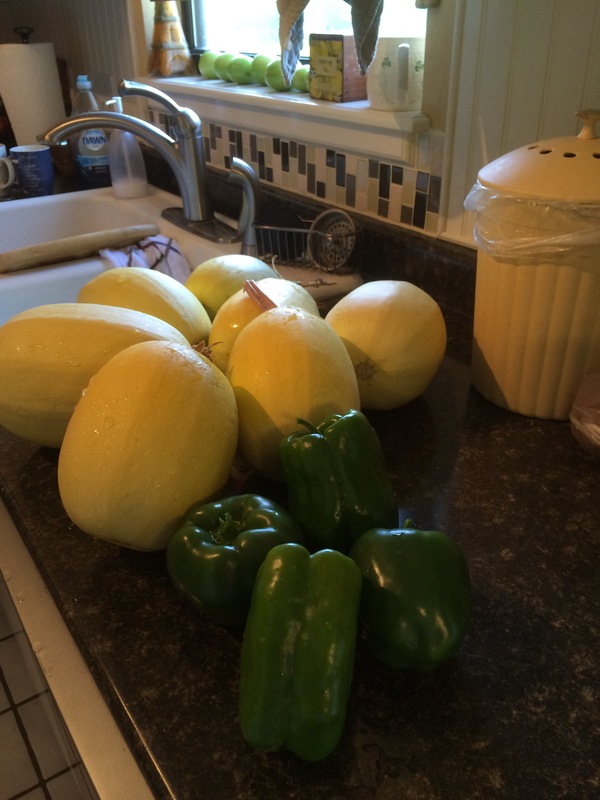 The large round green things turns out to be a spaghetti squash. It’s normally a fall plant, but then I didn’t plan to grow it. It is a product of the compost. Everything goes into the compost bin, including seeds. So when I tilled the compost into the soil, I planted it. Along with spaghetti squash I have bell peppers and Roma tomatoes growing which I did not intend to grow. Store bought tomatoes are often picked green. I’m surprised they had active seeds in them. Yet, here at harvest time, they are producing a large crop of tomatoes. Jesus said there is a harvest coming at the end of the age. At that time God will determine the true nature of every person. Some will show their true colors of being true fruit, others will prove to be false. He answered, “The one who sowed the good seed is the Son of Man. The field is the world, and the good seed stands for the people of the kingdom. The weeds are the people of the evil one, and the enemy who sows them is the devil. The harvest is the end of the age, and the harvesters are angels. Matt. 13:37-39. The Bible says that the true believers are those who are born of God by faith in Jesus Christ. The Spirit of God lives in them. They belong to the kingdom of God. Composting has made my organic garden very interesting. Now I have some extra spaghetti squash to share. At least now I know it is spaghetti squash. My question to you is this: Are you born of the seed that belongs to the kingdom of heaven? It will be revealed in the end. The harvest time is coming. It may be coming soon. I hope you belong to the good harvest.